Winter romance can be cold and calculating! Most duck species court and form pair bonds in winter. 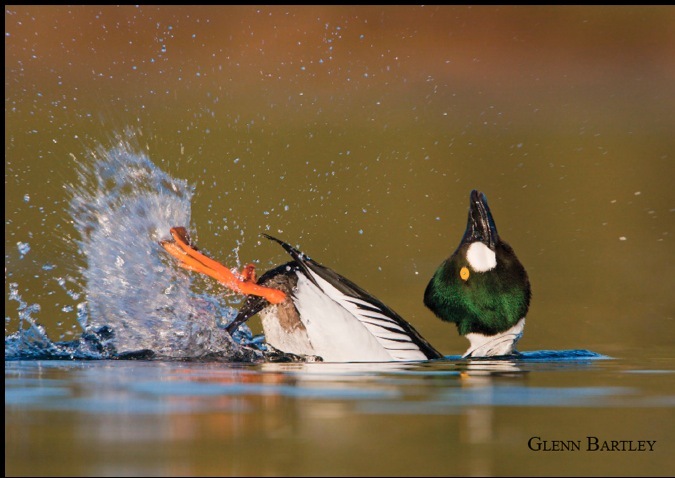 In the icy waters of Vermont’s Lake Champlain, Common Goldeneyes are getting hot! This male is displaying his signature move, the “head-throw-kick,” to attract a mate. Goldeneye pairs now bonding throughout the US will migrate in early spring toward breeding waters across Canada and Alaska. But the males are ramblers. After the female lays her eggs, the goldeneye male abandons his mate and parental duties. It’s common conduct among ducks! Most duck species court and form pair bonds in winter. Goldeneye pairs now bonding across the US will migrate together in early spring toward breeding waters across Canada and Alaska. But he’s a rambler. After she lays their eggs, the goldeneye male abandons his mate and parental duties. It’s common conduct among ducks. Winter romance can be, well, cold and calculating. Today’s show provided by Vermont writer and field naturalist Bryan Pfeiffer. Check out his blog when you begin at birdnote.org. I’m Michael Stein. Bird sounds provided by The Macaulay Library of Natural Sounds at the Cornell Lab of Ornithology, Ithaca, New York. Wing sounds of Common Goldeneye  recorded by W.W. H. Gunn. Calls of Common Goldeneyes engaged in courtship xeno-canto  recorded by P. Aberg.